Susan Lulgjuraj is better known as "Sooz" and she had been on my "want to meet" list for years. I finally got to meet her last year at The National, but it was almost by accident. Sooz is the Marketing Communications Manager at The Topps Company, a dream job for us trading card enthusiasts. Prior to that she worked for Beckett, was a blogger and a writer. I first became aware of Sooz during her blogging years (2007-2011). She was quite popular, because she knew her stuff, was intelligent and was an excellent writer. Basically, she was an ideal blogger. I had followed her career since then and always wanted to meet her. 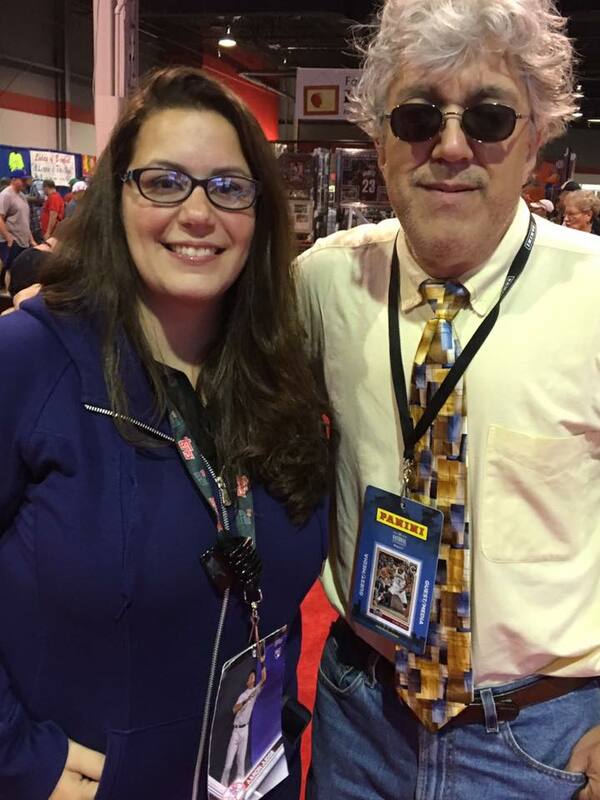 Last year, I was invited to cover The National Sports Collectors Convention. I was asked to interview "an executive" from Topps. I was happy to interview someone from Topps, the granddaddy of card companies, but when I realized I would be interviewing Sooz, I really was excited! Not only would I meet her, I would get to officially interview her. You can watch my interview with Sooz at On the Beat With Susan Lulgjuraj. Of course, like always, after the interview, I thought of several better questions. In the end, I am happy with the interview and happier to have met Sooz. I am not happy with my hair from that day,. though. Sooz was awesome in person, during the interview and in casual chat after it. I really appreciate her time and consideration. I also appreciate all of the entertainment she has brought me over the years. You can follow Susan Lulgjuraj on twitter to keep up with her updates. You might even be able to see her at The Natioonal, which starts today in Cleveland and runs through August 5. Susan Lulgjuraj and me in Rosemont, IL-August 2017.